No time to comment, but this is what happens to mice on a high fat diet, IF YOU FORGET TO ADD THE SUCROSE. I have the full text (thank you Luca via THINCS), high fat diet was about 42% of calories from LARD. Oleic acid plus PALMITIC acid (gasp and shiver, oh cardiologist). And cornstarch, no sucrose. Prof Yudkin: Yu wuz right, agin. 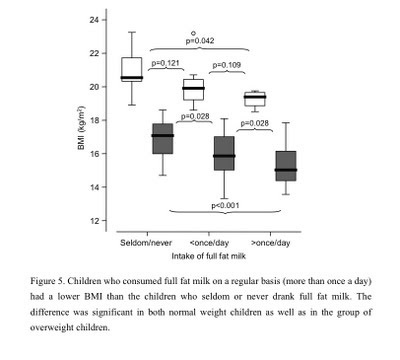 BTW fed and fasting plasma insulin levels and obesity were worse in the high fat mice, but at 35% of calories from corn starch that's not surprising. There was no suggestion of the massive hyperinsulinaemia seen in sucrose feeding, but levels were definitely up. Labels: When is a high fat diet a high fat diet? When there is no sucrose. OK, the blog has been a bit quiet postwise and replywise! We move house again of Friday and the lead up to it has not been particularly easy, but we're good to go now. As we move we will leave everything in boxes and head south (to where it is snowing, from Glasgow, where the sun is shining!) for the holiday period, about two weeks. I don't think a lot of posting will go on but we should have net access in the new house by the time we get back. I wish everyone a great time over Christmas, New Year and the Solstice. Edit 2: Have the text, many thanks all, Anna got in first. Ta! Thanks to Chris for this one. Could I ask for the full text please, anyone with access, to see what these jokers are up to again? Please bear in mind that Hunter is the group leader of Black, the guy who makes people prediabetic and forgets to notice or mention it, but still puts it in the results table! Is that dumb or... Discussed here. Hunter is owned by The Sugar Bureau, if you hadn't guessed. EDIT: I'll try to get to recent comments from the last post tomorrow, been a bit frantic today! But productive. Before I begin I'm going to put a few simplifications in place. I'm going to talk about 25(OH)D as Vitamin D because this is the substance in the blood produced from vitamin D3 in rough approximation to intake and/or available body stores. I will leave 1,25(OH)2D, the tissue active form, as exactly that. Ted Hutchinson posted a link to Dr Reinhold Vieth's discussion of vitamin D. Dr Vieth is extremely knowledgeable about vitamin D and is looking for an hypothesis to explain the prostate/pancreatic cancer paradox. Figure 1 sets out the paradox, which is observational in nature. 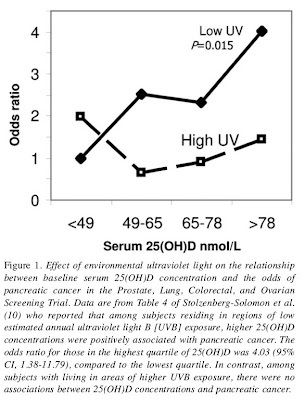 Under year round UV exposure conditions (low latitudes, broken line, "High UV") there is no association between 25(OH)D and either prostate or pancreatic cancer. At high latitudes (Solid line, "Low UV") there is a positive association between blood levels of 25(OH)D and these cancers. The average year round levels of 25(OH)D actually tend to be higher in northern latitudes, higher than those where there is year-round solar UVB. Vieth explains that we know almost nothing about the enzymes controlling tissue 1,25(OH)2D levels and much of his discussion is extrapolated from renal enzyme activity. Formation of 1,25(OH)2D is under the direct control of blood Vitamin D, the more Vitamin D, the more 1,25(OH)2D is formed. An increase in Vitamin D will immediately produce an increase in 1,25(OH)2D as the enzyme is just there and waiting for substrate. Eventually the production of the enzyme down regulates but by then there is plenty of 1,25(OH)2D. 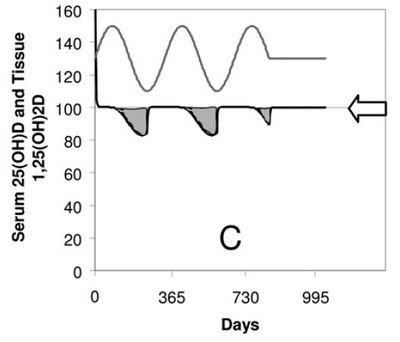 The degradation of 1,25(OH)2D is also under the control of blood Vitamin D. There is a lag in response of this enzyme so as blood Vitamin D rises there will eventually be increased breakdown of 1,25(OH)2D and all will be hunky dory with optimal tissue levels. 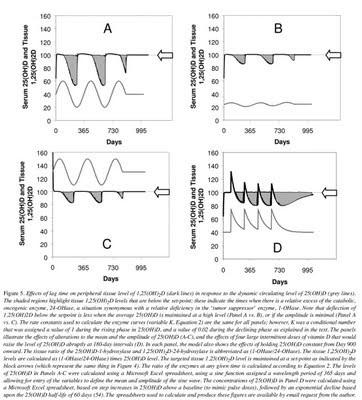 So there is no problem dealing with rising or steady state Vitamin D levels. The bug bear is during periods of falling blood Vitamin D levels. 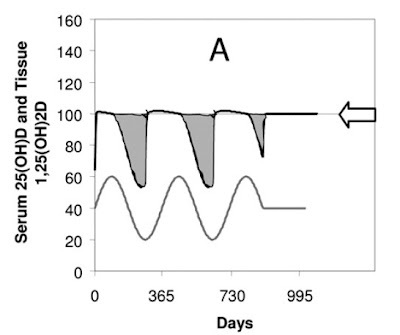 Falling substrate produces falling production of 1,25(OH)2D but the degradation enzyme is still active and takes time to shut down in response to low blood Vitamin D levels. The result is graph A in Figure 5. I'll put the whole figure up with legend after the individual graphs. In northern latitudes (in my hemisphere!) there is sub optimal 1,25(OH)2D from just after the summer solstice until the UVB comes back in March. The fall is relatively slow and the rise is rapid due to the enzyme kinetic reasons detailed above. Grey hatching suggests sub optimal or pro-neoplasic levels of 1,25(OH)2D in tissues. There are several implications from this hypothesis. Short term studies at constant dose rates will mimic the up-swing of Spring in the northern hemisphere. They should produce optimal tissue 1,25(OH)2D concentrations. The supplementation would need to be sustained and long term benefits need long term supplementation. Anything which produces a falling Vitamin D level will put you in to the unpleasant grey zone. 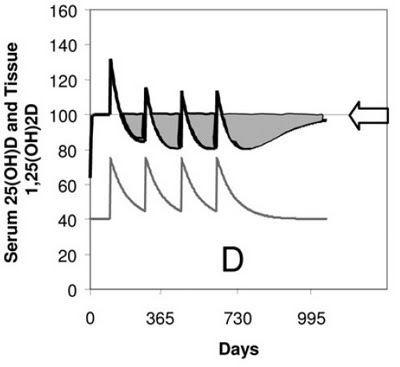 Large intermittent doses are the worst case scenario and are illustrated in graph D.
Stopping your supplements or reducing your dose rate will also put you in to the grey zone. The very simple message is, if you are going to supplement, supplement consistently and don't take more than a week off at any given time. But life is never quite that simple. It's time to look at graph B.
Graph B is the pattern of those southerners who get a bit of all year round sun but never go over the top or under the bar for sun exposure and Vitamin D levels. 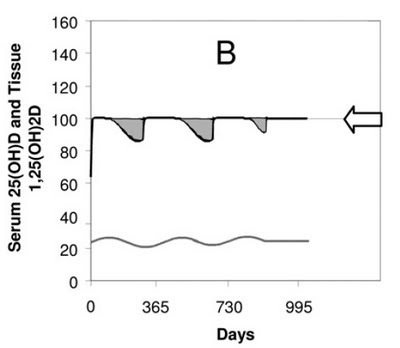 The grey zones in graph B look as small as those in "supplemented" graph C to me. Ultimately it is variations in vitamin D levels which produce the grey zones. Because the synthetic and degradation enzymes for 1,25(OH)2D adapt to blood Vitamin D levels, provided there is a basic minimum of Vitamin D, tissue levels should be OK. I'll take a break here and come back to the implications, especially for us Glaswegians, of diet in addition to sunlight and supplementation. Yes, but you have to be very unlucky! Olga posted these links on the liver and bacon post out of personal experience but as they won't get seen there, here they are again. To reiterate, you have to be very, very, very unlucky to become ill from eating reasonable amounts of liver, but it does appear to be possible... For the rest of the world, outside of this small number people with specific vitamin A intolerance, enjoy liver. Bacon and onions are a great accompaniment! Labels: Food: Liver; can you over do it? This is the paper for continued speculation about alcoholic and non alcoholic fatty liver disease. Rats again, to begin with! Endotoxin in the blood appears to be one of the best agents to convert a fatty liver to an inflamed fatty liver. The switch from fish oil to saturated fat lowers endotoxin somewhat (about halves it) but markedly reduces the products of the genes controlled by NF-kappaB. I was particularly looking at Table 4 where mRNA for COX-2, the inducible pro inflammatory cyclo-oxygenase enzyme, is reduced to zero and that for TNFalpha is markedly reduced. The mRNA for the housekeeping enzyme COX-1 is unaffected, as you would expect. It's also worth noting that fish oil/dextrose produces a zero level of mRNA for COX-2, rehabilitation fish oil somewhat in the absence of ethanol (or fructose?). Staying on endotoxin but switching to humans and fructose, we are all well aware that fructose is "associated" with fatty liver and that this association is probably causal. What I find far more interesting is that fructose is "associated" with increased plasma endotoxin in humans. I haven't found the intervention study to confirm a causal role of fructose on endotoxin uptake but, with the known effects of fructose on clinical NAFLD in humans, I think it will turn out to be the case. Fructose does seem to be the perfect replacement for alcohol if you want a tea-total cirrhotic liver. And be labelled a secret drinker by your hepatologist! To summarise, both alcohol and fructose cause fatty liver. 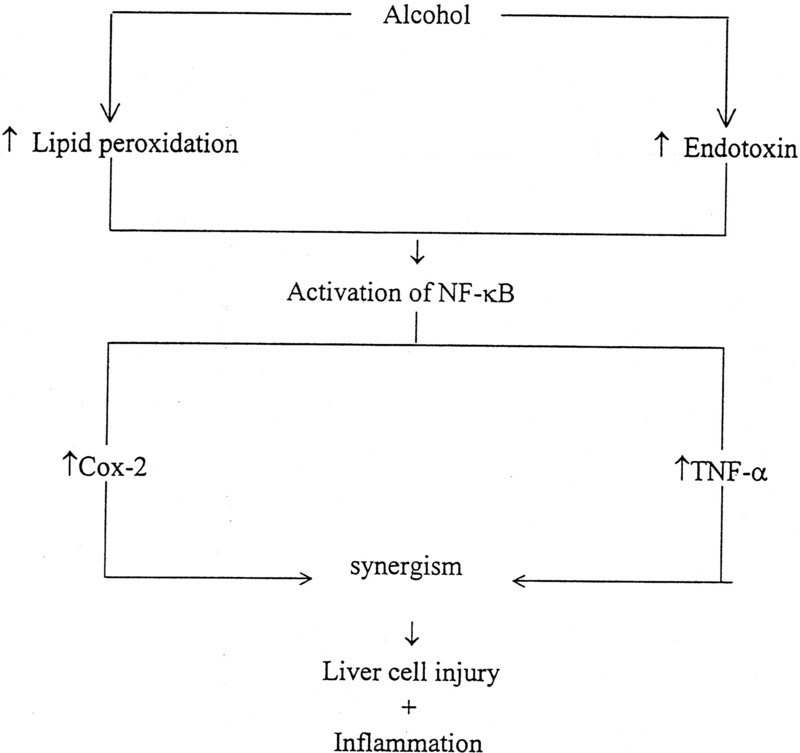 Both alcohol and fructose allow endotoxin from the gut to the bloodstream. PUFA (certainly omega 3, probably omega 6) enhance intestinal permeability effects. Endotoxin and the lipid peroxides from PUFA activate NF-kappaB. There is a cascade of inflammation in the liver as a consequence of this. I think it is also worth noting (from table 3 again) that non haem iron is elevated in the livers of those rats with maximum endotoxin absorption. This is another aspect of the common hepatopathy of iron overload which needs thinking about. The first paper in this post is just the abstract as Wiley Interscience are not particularly generous with access. There are lots of details about the diet (though not quite everything you would really want) in the second paper by the same group which is full text. These people are using ethanol/fish oil as their model for alcoholic cirrhosis. Now I have been very rude about these models and I should be a little more consistent but, what the... While fish oil/ethanol is a bit strange as a diet the findings are exactly the same as for the corn oil/ethanol combo, nutrients which might warm the cockles of any modern cardiologist's heart. Here is the first really impossible feat performed by the rats on booze. They can reverse both fatty liver and fibrosis of the liver. Stopping the alcohol intake does not do this UNLESS the fish oil is stopped and replaced with, you guessed, saturated fat. You can choose palm oil or coconut oil, either will do. Dextrose instead of alcohol won't hack it. Let's pretend humans and rats are the same. Let's pretend fructose and alcohol are the same. Let's pretend fish oil and corn oil are the same. Good game. Probably true. Let's think about human fatty liver progressing to hepatic fibrosis and inflammation, triggered by fructose and corn oil. I think this is common. Going to a low carb diet to treat fatty liver will clearly fail if all you do is stop the fructose. Something else is needed, something difficult to do in the current nutritional climate. You have also got stop the consumption of corn oil. You have got to eat saturated fat. Now that is not so easy in a saturophobic climate. How many people with fructose induced hepatopathy, who have been told that the cause is "unknown" are willing to adopt a diet which is based on that ultra demonic, evolutionarily catastrophic monster: PALMITIC ACID? OMG it might increase your LDL. Better die of cirrhosis than increase your LDL! As always, I have the greatest respect for Kwasniewski and I suspect the concept of liver disease being irreversible is completely specific to the context of the saturophobic modern nurtitional dogma. Waiting until your liver is a minute scrap of scarred fibrous tissue with a mass of non-functional hyperplastic nodules and is at end stage cirrhosis is a bit too late. Having a "mysterious" elevation in ALT is a good time to reach for the beef dripping. NAFLD and NASH are candidates for reversal. I'll kick around a few ideas about PUFA, endotoxin and cirrhosis in the next post. Oh, and fish oil: I think some DHA is a good idea, it has lots of uses in cell membranes. Drinking it by the tablespoon is not something I would recommend! Getting 30% of your calories as fish oil is OUT. Do not do this. I think it is becoming clear that the collection of problems known as metabolic syndrome appear to centre around liver pathology. I accidentally ended up in these posts via iron overload and MODY1 of all things. Anyway, here's an introduction to the strange world of alcohol research in lab rats. First I've got to apologise for these next few posts. They are mostly based around rats, fed by surgically implanted gastric canulae, with bizarre diets formulated to be fed as a liquid by constant rate infusion 23 out of 24h a day. Don't ask me why the rats got an hour off! I have to admit that I personally think lab rats are more like humans than many other observers do, but that may be because I've had so many of them as pets over the years. These rats do a number of things which are supposed to be impossible and a number which are just interesting. Before we go to alcohol, lets just look at saturated fat and weight gain. These diets are isolacoric to the nth degree. There is no need to correct for caloric intake. They all got the same, 23/7. So we are not talking appetite here, just calories in vs calories out. All diets were 45% fat with protein and carbs also held constant. The table doesn't specifiy but you can be certain that the carbohydrate will be glucose or a glucose precursor. If you are looking at alcoholic cirrhosis you're not going to feed fructose! Table 1 gives you the diet composition. That 45% of calories from fat was either pure corn oil or had increasing amounts replaced by a mix of beef and MCT fats. The highest saturated fat group had 30% of calories from saturated fat and 15% from corn oil. Table 3 gives you the weight gain. Just look at the control groups: "Eat" corn oil as your sole source of fat and you gain 5.5g/d. Replace some of that corn oil with 10% of calories from saturated fat and there is a similar weight gain but go to 20% of calories as saturated fat and weight gain drops to 4.9g/d and go to 30% of calories from saturated fat and weight gain is 3.8g/d. Under isocaloric conditions, simply switching from something quite like butter or coconut oil to "heart healthy" sunflower oil will make you FAT. Of course if you are used to eating butter and someone cooked your eggs in yellow boot polish you might lose weight because you would spit the "food" out on the floor anyway! The rats got no choice. Corn oil fattens relative to a beef/coconut fat mixture. Now it's worth looking at the effect of alcohol on liver pathology. This is best shown in Figure 2. Without alcohol the lipid composition of the diet has no effect on liver pathology (small black bars). Replace carbohydrate with ethanol and the lipid source of the diet determines you liver pathology. Corn oil is catastrophic. By the time you are eating 30% of your calories as saturated fat and only 15% as corn oil your liver is almost OK. I leave it to anyone's eye to follow the trend and think about a diet which has 45% of it's calories as saturated fat and none as corn oil. To me the message is clear. In the presence of ethanol the determinant of your liver pathology is the amount of corn oil you "drink". Fish oil does the same, the next few posts all use fish oil. If anyone thinks that fructose is different to alcohol in it's effect on the liver, you're wrong! I think the Food Standards Agency in the UK must have some sort of shares in liver transplantation programs or hardware. Oh, another aspect of this study; at a given level of corn oil the weight gain was always less in the alcohol group than in the control group. Alcohol calories were being substituted for carbohydrate calories. Alcohol is not insulogenic, carbohydrate is. I'd expect alcohol to be associated with less weight gain as blood insulin levels would be lower. Come back Gary Taubes. You wus right agin! Dr Jebb, it's not a closed system. Honesty is NOT the best, and certainly not the Government, policy. This is merely drugs. Imagine what would happen to Susan Jebb if she told the truth about current FSA advice on diet. She's possibly not as stupid as I thought, perhaps she shares intelligence with Professor David Nutt. He has the misfortune to be, in addition, honest and now unemployed. She has her job. EDIT: What happens if you decriminalise ALL recreational drugs. This is not a hypothetical question. Portugal did it in 2001. It's now nearing the end of 2009. Had you heard about this happening or the outcome? Certainly makes Alan Johnson look like a monster to me, oh.... I forgot, he's a politician! This is a very interesting paper about worms. The central thing to remember is that it is about WORMS. Most of us are not worms, but all of us do have mitochondria. Worm mitochondria are, I suspect, quite similar to human mitochondria, at least as far as basic signaling mechanisms are concerned. Glucose, as a molecule, is full of oxygen. One oxygen atom per pair of hydrogen atoms. You just need to add an oxygen molecule for each carbon atom to get just over 40 molecules of ATP. Fats are different. There are only two oxygen atoms down at one end of that long string of carbon and hydrogen. To extract the stored energy requires much more molecular oxygen, so makes more use of mitochondrial respiration. The electron transfer chain leaks free radicals. Running your metabolism on fat requires more use of the electron transfer chain. That means more free radicals. Generally free radicals are considered to be a Bad Thing. Actually, if you think about it, having your white blood cells throw free radicals at invading bacteria suggests that free radicals are one reason we are all still alive. Nothing is all bad. So worms, under glucose restriction, generate far more free radicals than those able to access glucose. Here's the best bit: The ones making all the free radicals also live longer. Don't forget, it's only a worm! Why do they live longer? Because mitochondria can only work by using oxygen to run the respiratory chain. If using mitochondrial respiration was damaging, we wouldn't do it! It's POTENTIALLY damaging. Given the few billion years we've had, metabolism would have stopped this free radical production if it needed to. Evolution hasn't made the respiratory chain leak proof. Why? Free radical generation is the signal that mitochondrial respiration is happening and it's time to up regulate the cell's routine protection against free radical damage that has stood the test of time. This does not involve going off and eating some poor plant to steal its antioxidants. Catalase, superoxide dismutase and glutathione peroxidase will do for a start. These are local antioxidant enzymes produced where they are needed, when they are needed by a cell which needs them to run its power plants safely. The fact that they seem to have overall benefits, apart from the smooth running of the mitochondria, is a useful spin off. And they don't involve eating anything green. Glucose restriction by any technique extends lifespan in worms. Glucose supplementation produces a dose related shortening of life span in worms. Glucose supplemented worms store FAT! N-acetylcysteine, ascorbate or a vitamin E derivative (Trolox) each eliminates the life extension provided by glucose restriction in worms. "In light of our findings, the current body of evidence tentatively calls into question the efficacy of increasing cellular glucose uptake in diabetics and suggests that other methods of lowering blood glucose (Isaji, 2007; Wright et al., 2007) may be preferable to achieve normal life expectancy in human type 2 diabetes patients." The two refs cited refer to techniques for extracting glucose through the kidneys or possibly reducing its uptake through the gut. No consideration seems to be given to not actually putting quite so much glucose in to the system in the first place! If anyone finds this remotely interesting, while not feeling particularly worm-like, you can go and look at the evidence in Jenny Ruhl's post on antioxidants in humans. I'd just like to point you towards this particular one. I was surprised that as little as 1000mg of ascorbate per day with 400iu of vitamin E had a measurable effect. But, if the study is replicable, it might well fit in with the observational evidence. Really must give up the chocolate (only kidding, my liver will save me!). There have been comments from two people on the blog recently who have developed symptomatic kidney stones. Very symptomatic in one case. I did a quick Google for kidneys stones and found that they can occur in up to 10% of the population, peak incidence between 30 and 50 years of age. A "significant" portion are asymptomatic. So why should two people on a high fat, lowish protein and low carbohydrate diet develop symptomatic kidney stones? That depends on what you think is happening and what actually causes kidney stones. There is quite a lot of information on PubMed about the physiology involved. One of the core findings is that magnesium is lost in to the urine under conditions of hyper insulinaemia and/or hyperglycaemia, most especially under hyperglycaemia. Some of the core observations were made by Djurhuus, predominantly looking at type one diabetics. While he accepts that elevated insulin causes Mg loss in the urine, hyperglycaemia appears to be the main drive. This gets to the point where you can correlate magnesium deficiency with HbA1c in type one diabetics. As an elevated HbA1c suggest relative insulin deficiency in this group, then hyperglycaemia appears to be the problem. It's open to speculation whether Mg deficiency is a specific cause of metabolic syndrome or a result of the hyperglycaemia associated with it, but there is undoubtedly a clear association between the two. Once you have mangled your magnesium status you appear to be wide open to calcium based stones. But the message I get is that Mg, Ca and PO4 are lost through the kidneys under glucose/insulin dysregulation. These strike me as the reason for the massive requirement of both calcium and magnesium in diets which promote hyperglycaemia. Calcium and magnesium are elements. You don't "break them down", they're there to stay unless you put them down the loo. If they are so essential (which they are) I doubt your body would do this if it was working correctly. So we have hyperglycaemia and/or hyperinsulinaemia as the most likely cause of urinary calcium, magnesium and phosphate loss. Once these ions are in to the urine subsequent stone formation depends on urine concentration and pH. In alkaline urine you get magnesium based struvite, in acid urine you get assorted calcium derived stones. Ultimately urinary stones appear to be a common feature of metabolic syndrome. They may well be present in much more than 10% of this population. What happens when you have metabolic syndrome and suddenly start living within the carbohydrate limits imposed on you by that syndrome? When you suddenly become normoglycaemic and norm-insulinaemic? I doubt any of us starting out on low carbohydrate diets gets an MRI done to check if we have renal stones before we begin, just on the off chance. A sizeable number of the population drawn to low carbohydrate eating might well carry asymptomatic renal stones. The stones then begin to dissolve once people stop peeing their bones down the loo. How many will convert a large asymptomatic renal pelvic stone to a smaller stone which can enter the ureter to begin its agonising journey to the bladder? I have vague memories of Kwasniewski and Lutz both warning about this feature of stone dissolution, and a similar scenario with gall stones dissolving and entering the bile duct too. Of course all of this may be total BS and the case might be that saturated fat causes renal stones. You could always just ask any cardiologist. BTW Djurhuus did an intervention study supplementing Mg in type 1 diabeteics. It REDUCES insulin stimulated glucose uptake! It's hard to see what is happening here. Usually type 1 diabetics are exquisitely insulin sensitive until some joker pumps then full of insulin then says "there's the bread, eat it to stay alive". Then it's not so clear what might happen to insulin sensitivity in the medium to long term. Anyway, Djurhuus didn't seem to find Mg to be a panacea of any sort. Dropped the LDL particle count thought FWIW! There are some interesting numbers in this paper from back in 2005. It's based around the well accepted fact that fat people move less than slim people. Apparently making heavy people move as much as thin people could easily result in 15kg of weight loss per year. That's pretty impressive for hiding the remote or putting drawing pins (thumbtacks?) on fat people's chairs. 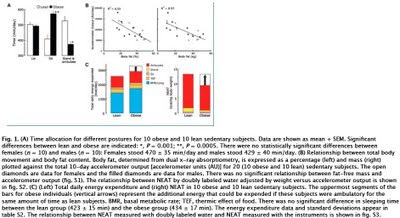 The paper looked in great detail at the movement and energy expenditures of mildly obese people (BMI 33) or slim people (BMI 23). They found, as expected, that slim people move far more than fat people. From section A, top left chart, right hand pair of columns, you can see that thin people spent about 510 minutes up and walking. Fat people were only up and moving for 370 minutes a day. But now look at chart C, energy expended by activity, left hand pair of columns. The big red blocks on the tops of the columns are energy expended by being up and walking. Ignore the white extension, that's just the projection of what should (but won't) happen under the thumb tack hypothesis. Thin people spent 800kcal per day on walking. Fat people spent, guess what: 800kcal per day on walking. Now, is that neat or is that neat? The lazy fatties were expending EXACTLY as many calories on being up and mobile as the slim people. This point seems to have escaped the authors' attention. Is this anti fat bias? Which group is laziest? Count those calories! In fact, the only real difference between the groups is that obese people spent MORE calories overall per day and the excess is spent on basal metabolic rate. You cannot argue with a big body. It needs fuel. BMR is life. Obviously they have to eat more to do this. The projection for 15 kg weight loss per year is based on making fat people mobile for as many minutes per day as thin people. But why should they do this? They are already spending as much energy as the thin person on spontaneous movement. They are spending MORE per day on BMR and an equal amount on odds and sods like the thermic effect of food. They eat more to make up for BMR and because their blood insulin levels steal a little food to store as fat. Making them move more would simply need more calories. They would be hungrier. The second phase of the experiment should have tested whether putting drawing pins on the chairs of fatties made them thin. The USA government is, after all, suggesting dance classes to replace TV viewing as the national pastime for its citizens. But I guess they really do know when they are on to a loser and decided not to test this. Weight loss means caloric deficit. BMR requires calories to sustain life so cannot be dropped much. The thermic effect of food etc expenditure makes little difference. If there are less calories spare during weight loss, what has to happen to movement? Look at chart A, right hand pair of columns. It drops from 390 minutes per day to 360 minutes per day, a drop of just under 10% in terms of time expended moving. Not statistically significant, but the trend is that weight loss by caloric restriction DECREASES spontaneous movement. This also was not noted by the authors, but would certainly have been predicted by Gary Taubes. Get them down to BMI 23 and they would probably stay as still as practical for as long as practical. Then move to steal some food. Over feeding makes you fat. It does it by increasing insulin levels. Do you then increase your spontaneous movement? 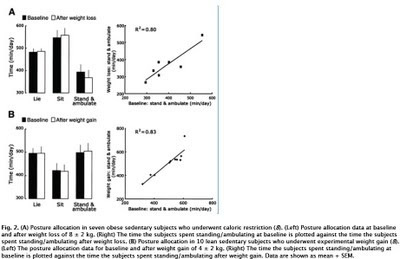 The average extra free energy available during an increase of 4kg weight gain is small if insulin is packing most of those calories in to adipocytes, unless you are the outlier who upped their movement time by an hour a day (possibly the most insulin sensitive in the group?). The trend in spontaneous movement doesn't really show, but what hint there is is upward. As Michael Eades has pointed out, he does see obese people who appear to be insulin sensitive, but they are uncommon. For most obese people the need is to lower insulin levels, then they won't need the thumb tacks on their chairs to either lose weight or become more mobile. But thumb tacks on chairs is official policy. Without doing the trial. Oh, I feel another paradox coming on! There are suggestions it is the same for humans. Just substitute "fatty liver" for the catalogue of abnormalities in the abstract (dysregulated glucose, insulin, leptin, the usual suspects) and you have the "high fat" (plus sucrose) fed rats in human incarnation from the last post. I don't suppose their offspring will have perfect liver function if weaned at day 1 on to a sucrose based formula. "Importantly, serum leptin concentration was affected by dietary sucrose intake both as quantitatively (r = 0.424, P = 0.009) and relative to energy intake (r = 0.408, P = 0.012) in overweight but not in normal-weight pregnant women." "The novel finding that dietary sucrose intake is related to serum leptin concentration is in line with the current dietary recommendations to overweight pregnant women with impaired glucose metabolism advising the lower intake of sucrose during pregnancy." Once upon a time life was so simple. You just went to the AHA for diet advice, did the opposite and you were pretty well sure to do well. But now they're talking about sucrose limitation. For the health of the USA this is excellent. But it makes life so complicated! How could the AHA get anything right? Must be an accident! Finally got to download supplementary data, table 1. Unfortunately the authors lied about this giving the diet composition! While giving a detailed breakdown of the evil fat, no suggestion was made as to the composition of the carbohydrate. "Lab chow" (is almost always starch) is being compared to a "high fat" diet of unspecified carbohydrate composition which produces fatty liver. It probably tastes sweet too. But no one is saying in the methods or supplementary data. This is not science! Dr Fine is looking at metabolic management of cancers. Cancers express uncoupling protein 2 (UCP2). UCP2 plugs in to the mitochondrial inner membrane, allows protons through, lowers the voltage across the membrane and so reduces both ATP and free radical production by the mitochondria. It might not be as physiological as UCP3, more of a survival tactic in hyper energetic states. UCP2 is not commonly present in normal tissues. Lack of respiration drives the use of glucose-lactate fermentation, adapted to the the hypoxic environment which is a common location of cancer cells. Ketone bodies are very special as regards mitochondria. I'll post on this eventually. But they switch on respiration (mitochondrial O2 based ATP production) and switch off glycolysis, ie they cause insulin resistance, but not at the GLUT4 level (post here). Dr Fine points out that cancer cells tend to use GLUT1, not GLUT4, so a non GLUT4 method of glucose deprivation might be a good idea. If a cancer cell's mitochondrial inner membranes are punched full of holes (UCP2s) then ketones cannot generate mitochondrial ATP effectively, but can still inhibit glycolysis. Result: decreased ATP and decreased cell growth. This is an aggressive cancer on a ketogenic diet. Dr Fine discusses the "model" like nature of his model, and it's flaws, nicely. Just tissue culture at the moment, but the project is aiming to go clinical at some stage soon. OK, time for a nap before a night shift. I was googling for an idea of what the current value is for LDL in the general population of the USA at the moment, when I accidentally hit on this paper. It's from the Japan cohort of the infamous Seven Countries Study, focusing on the farming town of Tanushimaru. Apart from the data presented, which are fascinating, there are the data not presented, which say a great deal more. What is also fascinating is the fossilised mindset of the investigators, inheriting from Ancel Keys the ability to look at, and in this case publish, data which destroy the lipid hypothesis as proposed by Keys so many years ago, but ignore what they have found. Lets look at some results tables. The pdf is copy protected so if you would like the actual data just download the pdf and have a look-see. I'll start with line one of Table 1, energy intake. This has fallen significantly between 1958 and 1999. Over that period BMI has risen from (Table 3) 21.7 to 23.7. The paper talks about less manual labour etc, suggesting BMI is some simplistic marker of calories in vs calories out. Duh. OK, people on the 1999 diet are storing more energy than they can access, compared to the massive caloric intake in 1958, which was being accessed at a rate which maintained a lower BMI. This to me suggests that the population in 1999 has a higher average insulin level despite lower carbohydrate intake. Think metabolic syndrome, not calories in vs calories out. You would expect people with lower carbohydrate intake to have lower insulin levels, but anyone who follows Stephan's blog or any of the Kitava posts here will realise that very high carbohydrate diets per se are not the problem. The problem is failure to maintain efficient glucose usage at physiological concentrations of insulin. Something happened between 1959 and 1999 to increase insulin levels despite lowered carbohydrate intake. This means insulin resistance. So the next thought is; what question do the investigators not ask, or at least not tell us so, if they did? Table 1 tells us that in 1958 the farmers were eating 2837kcal/d, 84% of which was carbohydrate, ie 2383kcal of carbs. Flicking to table 2 we can see they were eating 593g/d of rice, ie 2668kcal of rice!!!!!!!!!!!!!!!! OK, they were eating more rice calories than carbohydrate calories! The numbers don't quite balance but this is not banking (jk) we're talking here. Assessing dietary intakes and the associated calories is not hard science and these researchers are not exactly famous for precision. Essentially all of this caloric intake was starch. I don't see a lot of scope for fructose intake when you are eating more rice calories than carbohydrate calories! The same numbers in 1999 were 1365kcal as carbs and only 1062kcal of rice. There is now a deficit of 300kcal of carbs, ie people are now eating non-rice carbohydrate. The authors didn't comment on this. I don't suppose anyone who considers saturated fat to be the reason for elevated cholesterol would consider fructose, probably via sucrose, to have any relevance to cholesterol levels. My guess is that 8 teaspoons a day of sugar is enough to both do some glycation of LDL and to put enough fat in to the liver to raise hepatic insulin resistance. Probably not enough to increase heart attack risk, just enough to raise LDL cholesterol. Not enough to cause hyperglycaemia. Just looking at the numbers needing hypertension meds (see below) I would expect HbA1c to have begun to rise after 1982. Of course sons of Keys would never think to look at HbA1c evels. Too suggestive of Prof Yudkin's ideas! Is there any other support for the idea of progressively increasing insulin resistance? Back in table 3 we can see that BP is remarkably stable but there is a sudden increase in the percentage of the population needing hypertension medication to achieve this, from 7% in 1989 to 20% in 1999. The roll of elevated insulin in hypertension is not particularly contentious. If you had to say anything about overall health this line tells me that some sort of threshold was crossed in the 1990s. So where are the heart attacks? Smoking started to fall around 1980, from around 70% of adults (Kitavan levels!) to 45% in 1999. There was zero drop in heart attack rate with this fall. Why not? Perhaps replacing nicotine with fructose is a balanced trade off! Now, just to finish, TC levels skyrocketed from 152mg/dl in 1958 to 194mg/dl in 1999 and there was no effect on the incidence of coronary heart disease. How do the jokers running this cohort view their data, which destroy the hypothesis on which their jobs depend? "In conclusion, large changes in dietary patterns and remarkable changes in serum cholesterol levels among men aged 40-64 years in a Japanese farming area were demonstrated. Fortunately, incidence of coronary heart disease has not increased in our cohort for a couple of decades. The varied composition of the Japanese diet has probably prevented coronary heart disease. However, careful surveillance is needed in the future because of the increasing intake of fat, especially saturated fatty acids, with the potential of a modern epidemic of coronary heart disease in Japan." Cholesterol skyrockets, CHD doesn't. A paradox. Unless Keys was wrong and his "offspring" are still wrong. Oh, or the "varied composition" of the Japanese diet, of which 1000kcal/d is white rice, saves them (giggle, hysterical) from CHD!